The forts, monuments, and cities of India are fascinating but the intensive kaleidoscope of sights and sounds can wear one down. After seeing all the monuments and wonders of India, experience the natural side of India by “branching out” and boating. Just outside of Calicut, also known as Kozhikode, is Kadavu Resort, the perfect place to relax and get acquainted with Kerala. The resort, located on the backwaters, offers a choice of rooms or cabins, large pool, gardens, boat trips on the backwaters and Ayurveda treatments. Ayurveda is the Vedic system of health care that developed in India over 5000 years ago. This ancient science is health, not disease, specific and takes into account the patient's entire personality - body, mind and spirit. 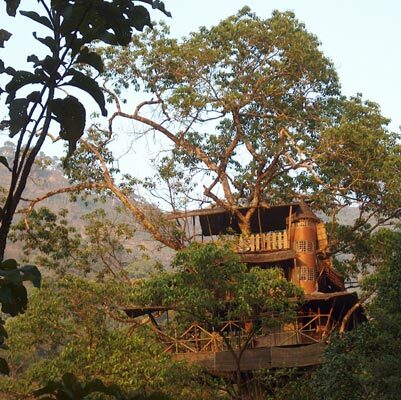 Most of our whimsical childhood daydreams fade as we grow older, but one Indian, Babu Verghese, turned his dream into a reality with the building of two multi-level tree houses, with all conveniences, 90 feet in the canopy of the cloud forest. 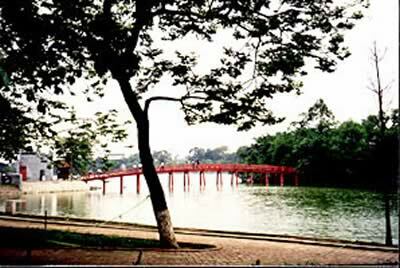 One tree house is connected to a tree-enshrouded ledge by a hanging bridge that creaks and undulates when people walk on it. The other has a water-weighted bamboo cage “elevator” to take guests to the tree-top accommodations. We opted for the tree house accessed by the hanging bridge. I spent the afternoon trying to read but was distracted by the expansive view of hills, mountains, and cloud-choked valleys that unfolded from our eagle-view veranda. It was so calm and serene that when two chipmunks came racing down the spiral stairs from the room above, charged through our bedroom and raced back up the stairs it gave me a fright. Of course it was their home before it was mine. In the evening, the air freshened, and we drifted off to sleep with a lullaby provided by nature’s mixed chorus. A long, low cry of a bird signaled morning’s arrival. Quickly nature’s symphony reached a crescendo and it was time to get ready for a new day. Showering al fresco high in the trees is definitely a unique experience. Breakfast is Keralan-style: dollops of delicious food served on a placemat-size banana leaf. In keeping with the ecological theme most of the food was organically grown vegetables prepared with the spices indigenous to Kerala. The energy source is a unique combination of solar energy, gober gas from cow dung and hurricane lamps with kerosene, avoiding conventional electricity and power from diesel generators, thus preventing air pollution and noise pollution. To the south on the coast is Cochin (Kochi), “The Queen of the Arabian Sea,” where cultures have crisscrossed for centuries making it one of the world’s more diverse locations. 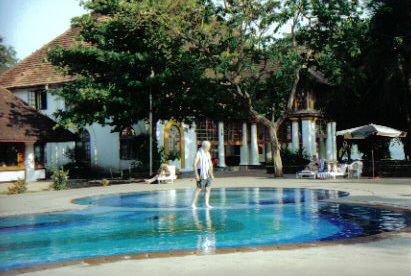 The Bolgatty Palace Hotel is a short but inspiring boat ride away from Kochi. Set amidst lush, tropical greenery, it is one of the oldest existing Dutch palaces outside Holland. A Dutch trader built this quaint mansion in 1744. In 1909 the palace was leased to the British and it served as their residency till 1947 when the British Raj came to an end in India. The quiet location offers expansive views of the mainland. 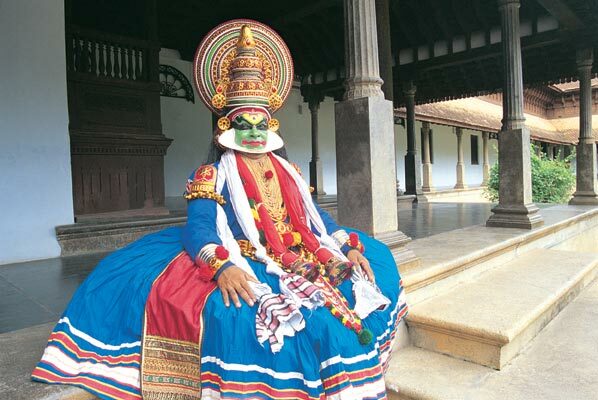 Don’t miss the Kathakali show, the ancient classical dance form of Kerala, which is a grand mix of dramatics, vocal and instrumental music, dancing and mine. Many years of training go into learning the art form and it takes four hours to prepare for the dance. Before moving off to the backwater check out St. Francis' Church, the oldest existing European church in India. The most enduring impression of Fort Kochi is the enigma of the Chinese fishing nets. Like totems from another age stranded in time, they perch along the backwaters. The Chinese fishing nets are the most efficient means of backwater fishing and Fort Kochi is full of them. The Dutch palace at Mattancherry was actually built by the Portuguese and presented to the Kochi ruler Vira Kerala Varma in 1555 as an act of expiation for the plunder and desecration of a temple near the Raja's palace by a hot-headed young Portuguese officer. The real glory of the palace lies in its wall murals, all done using the tempera process of painting. Mattancherry has a predominantly Muslim population. But tucked away behind its tumult is Jew Town, a quiet cul-de-sac where the few surviving members of the oldest Jewish settlement in India live. Visit the temple. Kerala has hundreds of miles of backwaters where the building of levees and canals has reclaimed the land for rice cultivation. 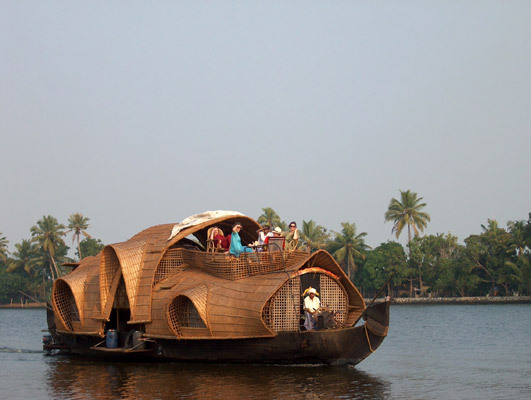 The best way to see the backwaters of Kerala is by kettuvallam, a houseboat made from the no-longer needed rice boats and covered with woven mats to resemble the rice barges. For three days we were poled through the palm-lined canals mesmerized by the scenes of village life unfolding before us. Our kettuvallam moved so quietly that we had time to chat with people along the way. When our crew of two pole men and a cook took a break we wandered along the levees, visited churches, shrines, bought fish for our meals, and chatted with the friendly people. Toward evening we headed for the lake so as to be out of the canals during the night when the fishermen set their fishing nets. The fiery red balloon sun set, going for its bath they say. When the brilliant yellow, “cleansed” morning sun was well above the horizon we headed back into the canals, along with vendors in small canoes selling fish and toddy, a mild alcoholic drink tapped from the sap of the palm tree. Another wonderful day in Kerala begins.